Bremerton’s Olympic champion will be answering questions Friday via the U.S. Olympic Team’s Facebook page. You can post questions now and Adrian will answer them Friday. Adrian won two gold medals and a silver at the London Olympics last summer. Olympic champion Nathan Adrian of Bremerton pulled out of the finals of the 50-yard freestyle Thursday at the Winter Nationals in Austin, Texas. Adrian jammed his right pinkie finger on a lane rope while warming down after the morning preliminaries, according to a report on swimswam.com. “Sad news but I don’t want to hurt it any more!” Adrian wrote on Twitter. Adrian said the finger is not broken. Adrian told Swimming World’s Jeff Commings that he was out of the rest of the meet. Adrian had posted the fastest time of the day, and a meet record, of 18.82 seconds and was the favorite to win the title and possibly break his American record of 18.66. Adrian, who won two golds and a silver medal at the London Games this summer, was also scheduled to swim in Saturday’s 100 freestyle. Bremerton’s Nathan Adrian, swimming competitively for the first time since winning three medals at the London Olympics, set a blistering pace in the 50-yard freestyle at the Winter Nationals Thursday morning. Adrian touched the wall in a meet record of 18.82 seconds. He is the American-record holder in the event in 18.66, which he set in the 2011 NCAA championships as a senior at California. The Olympic gold medalist will be the No. 1 seed in the finals, which can be seen via livestreaming at usaswimming.org, at 3 p.m. local time. Nathan Adrian shot to stardom overnight it seemed. On Thanksgiving, he and Olympic teammate Peter Vanderkaay were in the Detroit parade. That was after taking a quick trip to Malaysia to shoot for the cover of the August Man fashion magazine. There’s video of Adrian on Uinterview that surfaced this week from before London talking about the road to Rio in 2016, nutrition, his training regimen and whether or not he’s single (yes, he is). This week he will be back in the water, competing for the first time since London, at the Winter Nationals in Austin, Texas. Adrian will swim Thursday in the prelims of the 50-yard freestyle. Adrian will swim the 100 freestyle on Saturday as well. The meet will be available via live-streaming at USASwimming.org. Prelims are at 7 a.m. (local time) and finals are at 3 p.m.
It’s also the first time Adrian will be swimming yards since he won the 50 and 100 free titles in 2011 at the NCAA championships as a senior at California-Berkeley. Olympic champion Nathan Adrian is among some of the top swimmers in the country that will compete at the Winter National Short Course championships in Austin, Texas, Thursday-Saturday. Adrian, a Bremerton native, will be competing for the first time since winning two gold medals and a silver at the London Olympics in August. Adrian won the 100-meter freestyle to give the U.S. the gold in that event for the first time since 1988. Adrian will swim in the 50-yard freestyle Thursday and the 100 free on Saturday. He is the American-record holder in both events. Adrian is seeded first in the 50 in 18.66 seconds and first in the 100 in 41.10. Also competing are fellow Olympians including Ryan Lochte, Missy Franklin, Jessica Hardy, Allison Schmitt and Matt Grevers. Preliminaries begin at 7 a.m. local time and 3 p.m. for the finals. The meet will be shown on NBC on tape delay at 2 p.m. Sunday. Nathan’s new-found celebrity status has kept the soon-to-be 24-year-old plenty busy since the summer, with multiple guest appearances on TV, photo shoots and appearances at New York’s Fashion Week. He seems to have taken a shine to modeling, going as far as Malaysia for a fashion shoot. 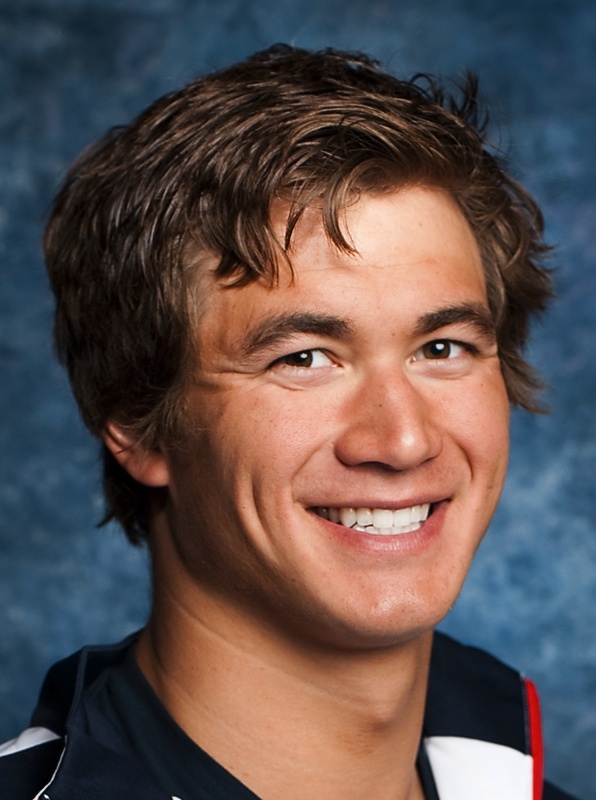 Nathan Adrian won three gold medals at the London Olympics. Bremerton gold medalist Nathan Adrian has joined with The Salvation Army to support the organization’s Red Kettle Campaign. The Salvation Army said Thursday the four-time Olympic champion will be making online and in-person appearances through the holiday season. Adrian’s father, Jim Adrian, and mother, Cecilia, have supported the Bremerton Salvation Army for many years. Jim Adrian was recently elected as Chairman of the Advisory Board for the Salvation Army in Bremerton. Nathan Adrian will take part in a Q & A with The Salvation Army, which will be posted on the organization’s website, blog.SalvationArmyUSA.org; he will serve as honorary chairman for the organization’s World Record Bell-Ringing contest; and support the organization’s Rock the Red Kettle Concert in Los Angeles. “Nathan is a true American champion, not just on the podium, but in the hearts and minds of young people who look up to him for inspiration,” said Major George Hood, National Community Relations and Development Secretary for The Salvation Army. In case you missed it earlier Thursday, Bremerton’s Nathan Adrian did a live question and answer online chat with fans via the Seattle Times. Here’s a link to the chat. 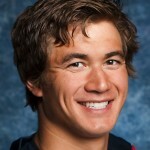 Bremerton’s Nathan Adrian has been nominated for three 2012 Golden Goggles awards. The Golden Goggles are USA Swimming’s equivalent for the Emmy’s. Adrian was nominated for the male athlete of the year, along with Ryan Lochte, Michael Phelps and Matt Grevers, as well as race of the year for his performance in the 100-yard freestyle and the 400 medley relay. Adrian beat favorite James Magnussen of Australia by .001 seconds. The awards are Nov. 19 at the Marquis Marriott Hotel in New York. Adrian also won gold in the 400 medley relay and a silver in the 400 free relay. You can vote by going to this link. Team USA released three more videos on Nathan Adrian and his visit home to Bremerton after winning two gold medals and a silver at the 2012 Olympics in London. The first video is entitled Nathan Adrian Qualified — Hometown Hero. The video showcases the City of Bremerton honoring Nathan, including his street naming ceremony in August. The second video, Nathan Adrian Qualified — Champion’s Return, the Adrian’s reflect on Nathan growing up in Bremerton. The third is a look back at how the Bremerton native achieved the ultimate dream of any swimmer with interviews by his family, coach, teammates and yes, yours truly. Here’s the link for that video. 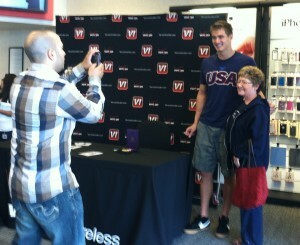 Bremerton’s Nathan Adrian made his first public appearance in Kitsap Tuesday with a two-hour meet and greet at the Verizon store in Silverdale. About 422 fans waited to offer their congratulations to the gold medal champion. 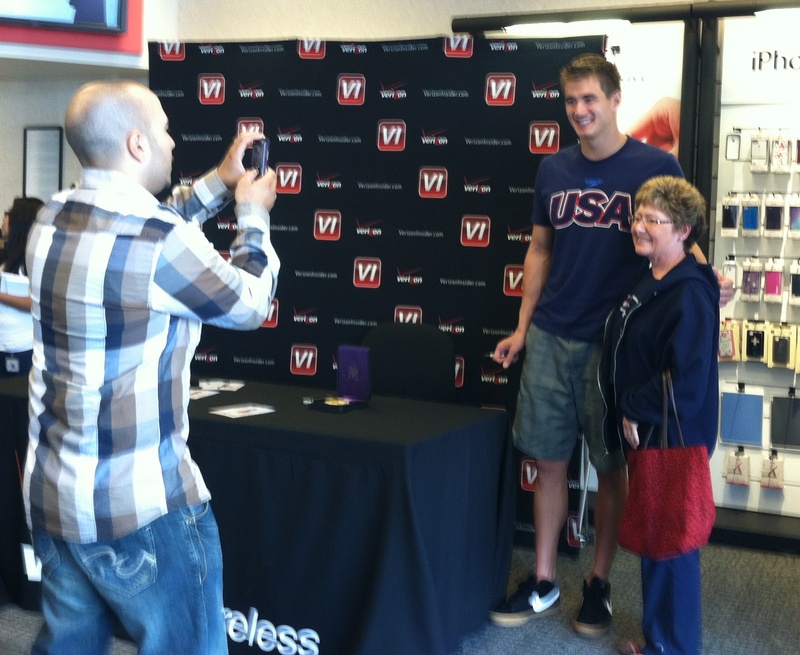 About 422 fans waited in line for hours in order to get an autograph and photo with Bremerton’s Olympic gold medalist Nathan Adrian Tuesday at the Verizon store in Silverdale. The line snaked out the store and down the sidewalk as fans had their first chance to congratulate Adrian, who signed autographs — on posters, t-shirts and even a baby, for two hours. Adrian won two gold medals and a silver at the London Olympics, including the 100-meter freestyle. In just two Olympics, Adrian is already the most decorated Kitsap Olympian. He also won a gold medal as a member of the 400-meter freestyle relay from the 2008 Beijing Olympics in which he swam in the preliminaries. Adrian’s public appearances continue Wednesday at the Kitsap County Fair & Stampede. Adrian will be feted by Bremerton dignitaries on the main stage at the Fairgrounds at 4:45 p.m. Following that appearance, he will head over to Gene Lobe Fields for the pregame ceremonies for the Babe Ruth World Series Championship game at 5:30 p.m. He will then head back to Thunderbird Stadium and make another appearance at the Xtreme Bulls event at 7 p.m.
Thursday, Adrian will fly to L.A. for taping of The Tonight Show with Jay Leno. He will appear as a panel guest before flying back to Bremerton. The show airs Thursday at 11:30 p.m.
Security personnel were able to snap photos and get autographs from Nathan Adrian, who won two golds and a silver medal in the London Olympics earlier this month. Tuesday was the first public appearance for the Bremerton native.